Verizon and LG have teamed up to offer yet another deal on this year’s LG G4. 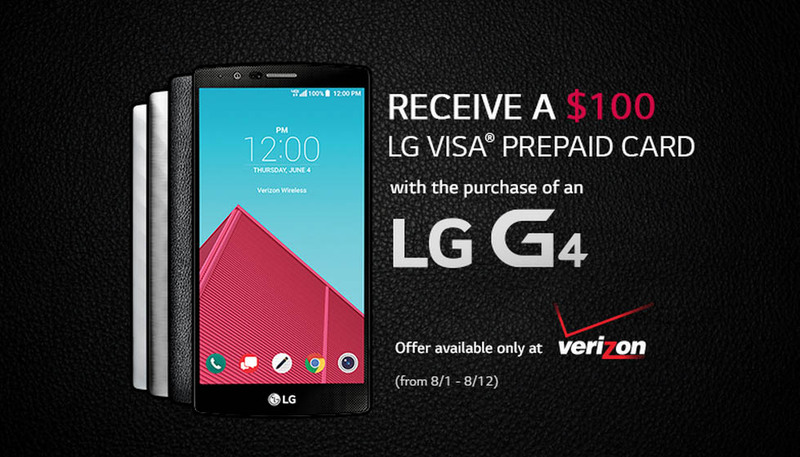 If you buy LG’s newest flagship at “eligible” Verizon shops from today through August 12, you can grab a $100 Visa prepaid card with it. I’m not seeing any limitations as far as how you have to buy it. In other words, I believe that you can buy it on contract, through Edge, or pay full retail and still get the $100 back. Verizon and LG are requiring that you buy the leather black, metallic gray, or ceramic white models, but those are the only three they sell anyway. Once purchased, the rebate site below will help you claim your prepaid card.